A green step for London. 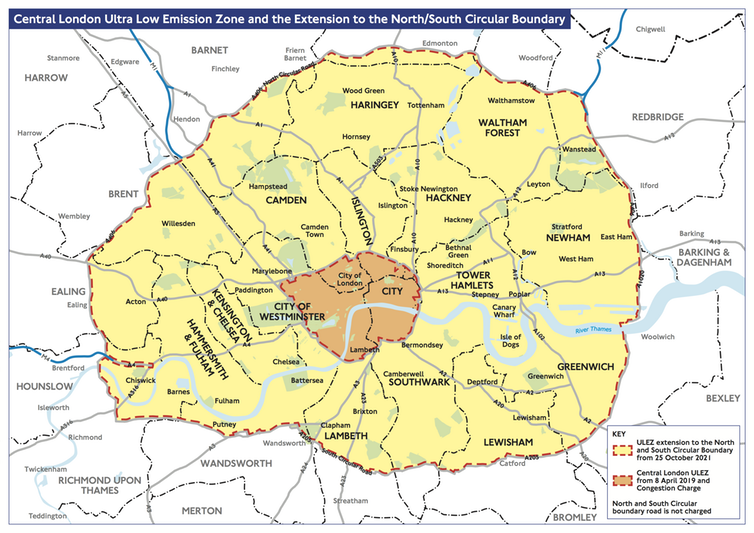 Initially, the ULEZ will cover the same area as London’s congestion charging zone. In October 2021, the ULEZ charging zone will expand beyond central London to cover all of London within the capital’s major circular arterial roads - the North and South Circular – encompassing 3.8m Londoners. Expanding the ULEZ will require investment in new monitoring infrastructure the cost of which has been estimated at £700m. The scheme is expected to raise £220m a year - but this will only cover its operating and set-up costs. Any further revenues raised from the ULEZ are earmarked for measures to make the city’s public transport fleet “clean and green”, and reduce pollution across the transport network. The objective of the ULEZ is not so much to raise funds, but more to change driver behaviour. Ultra Low Emissions Zone following expansion of the zone in October 2021. The ULEZ will replace two existing charges for vehicle emissions – the Low Emission Zone and the Toxicity (T) Charge – and will piggyback on some of the existing processes and infrastructure in its first phase. Automatic number plate recognition cameras, installed at all entry points to the charging zone, will record the number plates of all vehicles entering the charging zone. Drivers will have to pay the daily charge via the TfL website, app or phone line by registering their car and bank card for automatic payment. Failure to pay for will result in a hefty fine: £160 for cars or vans and £1,000 for lorries or coaches (discounted by 50% if paid within two weeks). Residents living in or immediately next to the congestion charge and ULEZ zone are exempt from the charge. This will expire in October 2021 when the ULEZ is expanded. Taxis and designated wheelchair-accessible private hire vehicles are also exempt from the ULEZ charge. London is taking strides to tackle poor air quality, but other cities have been more radical. Milan, named as Europe’s most polluted city in 2008, banned the most polluting cars from the city centre for short periods in response to high levels of pollution as early as 2007. In 2013, Milan introduced an emissions-based daily charge to drive into the city centre – some “clean” vehicles were exempt. This proved not to be enough to clear the smog. At the beginning of 2019, Milan went a step further and banned the most polluting vehicles from driving on the city’s streets at all. The city has also set out a strict timetable to tackle air pollution caused by road traffic: each year emission standards for vehicles will tighten and vehicles not meeting the low emissions standards will be banned. London and other cities across the globe should consider following in Milan’s footsteps and banning the the most polluting vehicles. In London, a quarter of all NOx emissions from road transport are produced by diesel cars. Clamping down their access to the worst polluted areas in central London could bring about more rapid improvements in air quality. London’s ULEZ has strong public support: nearly 60% of more than 18,000 respondents to the mayor’s public consultation on the ULEZ strongly support the principle of the scheme. And nearly two-thirds of respondents supported the earlier implementation of the ULEZ. With such high approval ratings, the mayors of London and other cities might risk being bolder. Oslo plans to make the city practically car free by 2020, through measures such as removing parking, pedestrianising streets and raising the congestion charge. Indeed, authorities for the City of London (London’s historic financial district) have already banned the most polluting cars from one of the busiest streets. In the autumn of 2018 they went a step further and announced that half of London’s historic Square Mile would be “pedestrian priority”, banning motor vehicles and requiring cyclists to give way to pedestrians. As the City of London takes the bold decision to prioritise the nearly half a million workers arriving by foot and public transport each day – over the few by car and taxi – this should give the rest of London, and other cities around the world, pause to consider what more they could be doing to reduce emissions and make public spaces safer and more pleasant for everyone.